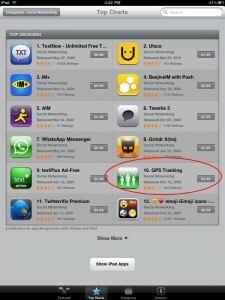 Locimobile’s most popular app, GPS Tracking made the Top Grossing App list on iTunes. Available on iPhone, iPod, iPad and Android, GPS Tracking is a real “must have” app. Coming soon to BlackBerry. Apple’s iPad (pictured to the right). Download GPS Tracking today and join over 250,000 users in over 80 countries who are using the app. Android users search “GPS Tracking” in the Android Market. iPhone users download from iTunes. Thanks for your help making us one of the Top Ten Apps on iTunes.